Overclockers.com met with Gabe from Swiftech at the Consumer Electronics Show last week for some big news from the water cooling manufacturer. They have released a new all-in-one water cooling system of their own design. This unit is targeted to compete directly against similar units, and they had a side by side test setup in their suite to demonstrate for us. All-In-One – This is an all in one unit like you are familiar with. It ships already assembled, pre-tested, pre-filled. You simply mount the block on the CPU and the radiator within your case then you are ready to go. 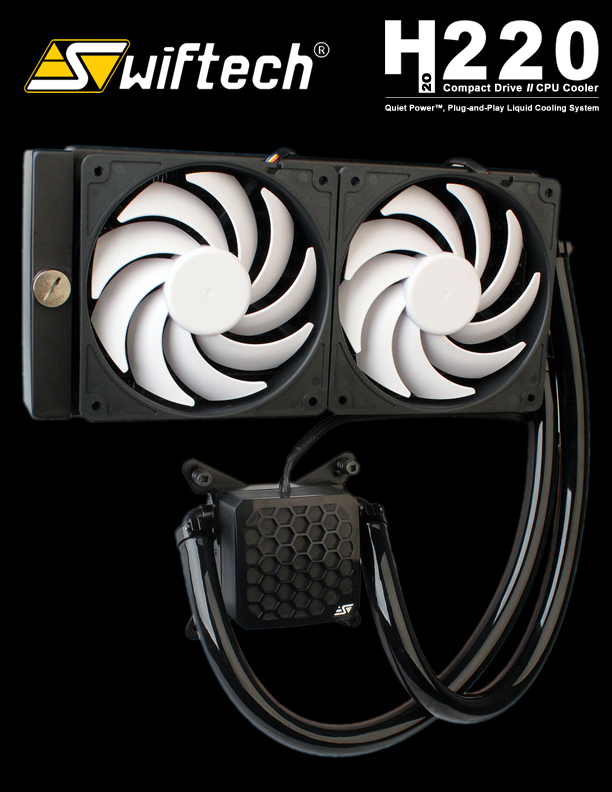 Pump – A pump is the centerpiece of any water cooling loop. The water flow rate and the fan’s air flow combine resulting in the final performance capabilities of your water cooling loop. Swiftech designed their own pump for this application. To achieve the targeted performance in flow rate and head pressure, the pump’s impeller was designed with similar features to the popular Laing pump already popular among water cooling enthusiasts. The pump runs on 6 watts of power, about 5 times the power draw from similar all in one units. To tune the acoustics keeping things quiet, spaces within the pump housing were injected with epoxy. Radiator – The radiator was carefully designed for the purpose. It’s dimensions compare favorably to similar water cooling units while its mounting holes are placed in such a way to make installation “fool proof”. Expansion Ability – This unit is made to be customized. Competing All-In-One units from other manufacturers are not made to be changed, making it either very difficult or impossible to expand them. The Swiftech H220 can have additional water blocks and radiators added to the loop, and in fact was demonstrated for us running Heaven on dual GPUs with additional radiators – all driven by their compact pump built into the waterblock. Those are just a few highlights for now which we were eager to share with you. We’ll have more to say once our in house testing is completed. However, I’d currently say we should expect the position of this unit in the market to be competitive. Swiftech has been a powerhouse in watercooling for over a decade and they’ve waited to enter the all-in-one water cooling arena until they had a product ready that met their high standards. They have combined the ease of installation of an all-in-one with their own custom designed pump, enabling beginning water cooling enthusiasts to get a start on water while retaining the option of upgrading their loop later on to include additional components. The pricing of the unit will be in the same ballpark as the Corsair H100i and the Thermaltake Water 2.0 all-in-one units, at an MSRP of $140. We’ll have more details available once we complete review of the sample we brought home with us from the meeting! I honestly considered buying one of these so I could upgrade my wifes current custom loop with an X2O 750 pump/res unit because it lacks the pressure to push her new system the way we want. Ending up with a complete spare loop left over is the only reason I didn't wait for this to drop. After looking over the info at XS and a few other sites Im in love with this thing. For people who want to build a custom loop who either cannot afford to buy all at once or want to see what WC can do and experience it before making the plunge these are fabulous. I watched a vid on Youtube where Gabe showed off this unit against the H100i and TT Bigwater, all other parts being identical. Pretty impressive from every measurement. Even with adding GPU cooling on dual cards it rocked. One little secret about that video demo (by linustechtips) is that the swiftech units in the demo had a lower VID. 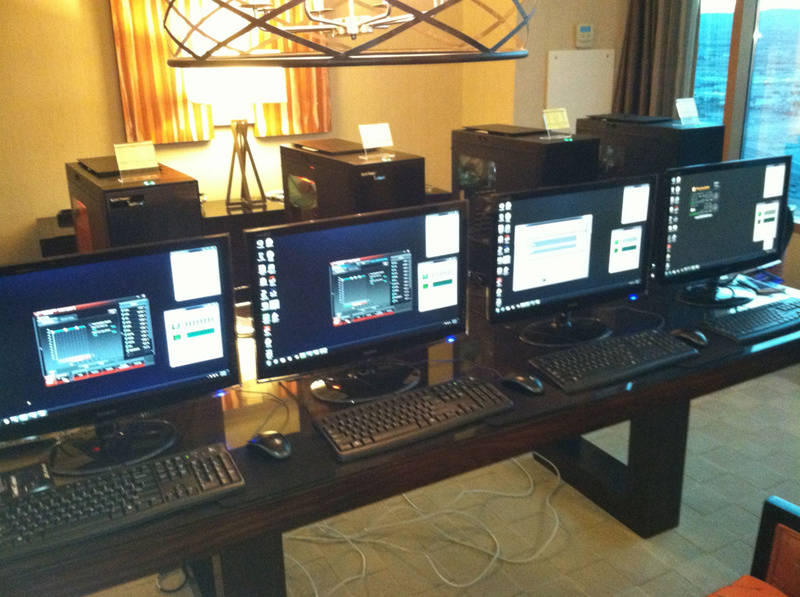 The unit on the far left (Swiftech) in the demo had a VID of 1.17 while the unit on the far right (Tt) had a VID of 1.25. The corsair unit, second from the right, had a VID right around 1.23. That isn't a huge voltage difference, but the overclock on each machine was applied by using ASUS automatic 4.6GHz settings... The resulting voltage actually provided to the chip will vary, based on VID. This was not hidden, the VIDs were right on the display monitors, and they told us exactly how they applied the settings. So the demonstration setup could have been made more level had they manually applied voltage and frequency settings rather than using the automated 4.6G mobo feature. But that said, there are design advantages to the Swiftech unit that likely give it a performance edge. While we were there we observed readings but we didn't report any of those, because at the end of the day its a manufacturer demo. Instead we asked good questions, talked A LOT about the design, and really took a good understanding away of the time and effort that went into making a Swiftech All In One unit that wasn't Yet Another Asetek/CoolIT rebadged unit. If considering an All In One to get into watercooling, to me this H220 seems like the only right answer. Most importantly for people like us, it is the only one with an upgrade path - you can add more components to it without much trouble, and it has had more research and development put into the pump to ensure it can support a growing loop beyond what it ships with. IMOG, how's Gabe doing? Looks like he busy as usual. Staying on top of the pile as far as I can see. he has released many great products in the last year and now a really amazing AIO that can top all others. We'll see more as the reviews come in. I think I saw a tidbit that OCF is getting one to review. And, how was the dinner at Peppermill? Just couldn't make it happen. Glad I could share it with you for a neat Vegas spot to meet. I'll work on making next year better at CES for me, I could figure out a way to take a week off if I can do the show and hang with youz folkz. And Fugger is talking a OC event next year.